Disney Dos and Don’ts II: Solidarity Sisters! | Y'all Behave! Disney Dos and Don’ts II: Solidarity Sisters! The first female fight fest that comes to mind is in the tension-filled household of Cinderella and her Stepmonsters. Her Stepmother not only makes her a slave in her dearly departed father’s home, but her stepsisters treat her like the flea-ridden family dog on a good day, and a whipping boy on the bad ones. For me, as a young girl watching this, it wasn’t just the constant chore orders and shabby quarters that made me love Cinderella and loathe the Stepjerks, but the Stepmother’s constant malicious and manipulative way of treating Cinderella used to make my blood run cold upon hearing her bone-chilling voice, and my blood boil when she would hurt Cinderella. How could any woman, let alone one who is for all intents and purposes the girl’s mother, ever treat another woman this way? DON’T! She couldn’t stand to see Cinderella happy in any part of her life. Her hatred of Cinderella had to be rooted in some jealousy: of her late husband’s love of Cinderella? because Cinderella is a knockout with a voice like an angel and her own daughters are two tone-deaf toads? The theories of motive swirled through my head, none of which warranted such evil behavior. When Cinderella escapes her tower, pops the slipper on her pretty foot, and rides off to a better life with her beloved animal pals in tow, I always thought how benevolent she was not to have had her stepmother and stepsisters dragging behind the carriage. Her magnanimity: a DO, a DON’T? I’m on the fence. Stepmothers’ street cred takes another nosedive in Snow White and the Seven Dwarves with a forbidding female villain even more evil, though easier on the eyes, than Cinderella’s foes. (Though there may have been far less blended families at the time these movies were created, the damage has been done to the reputations of stepmothers! 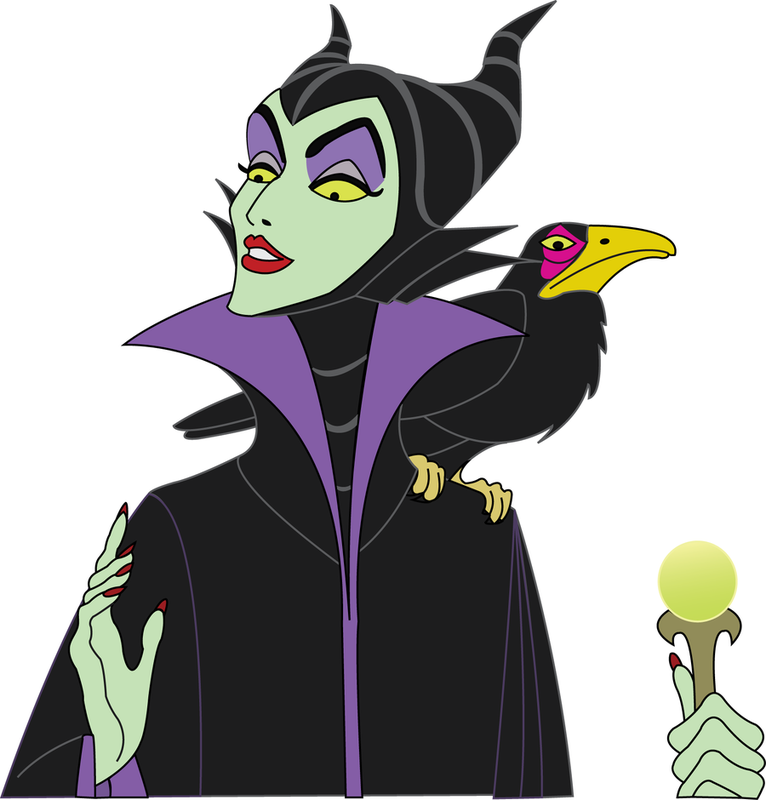 I explain to kiddos watching these that stepmothers aren’t all crazy, wicked, and lethal. These are a few bad apples–no pun intended.) 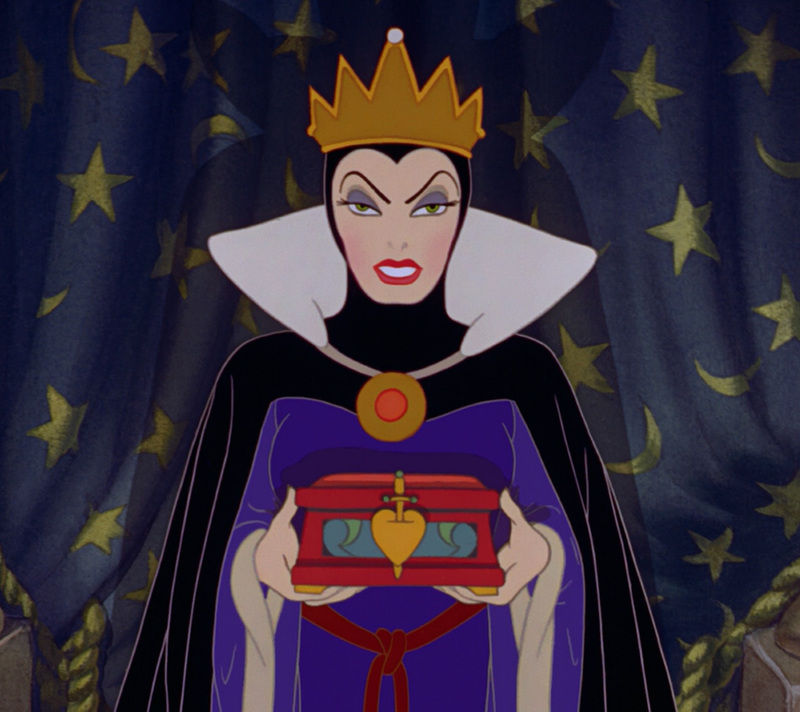 The Evil Queen is straight up wicked, even putting a hit out on her own stepdaughter; her murderous instructions to a huntsman, “Bring me her heart!” Snow White is yet another example of jealousy rearing its ugly head in the Disney microcosm: The Evil Queen’s reign as “the most beautiful one of all” is threatened by Snow White, and so, she must die. Whatever happened to women building each other up, fostering within each other and themselves a sense of the female family? I feel that along with the obvious DON’T of victimizing another person (especially one’s own stepdaughter! And with a poisoned healthy snack no less!) because of one’s own insecurities, the double DON’T of Snow White is The Evil Queen placing her entire self worth on her looks,(what is the point of being beautiful on the outside if you’re ugly on the inside?). It has always resonated with me, and whenever I’ve felt threatened by or envious of someone else, I always remember Snow White, that Snow White’s beauty didn’t make the Evil Queen ugly, just as someone having something is not the reason I do not. In that way, the message imparted is a DO! Sleeping Beauty is the story of a princess exiled upon infancy for the sake of her own safety from a sorceress disgruntled at not being invited to the celebration of her birth. Now, we know that in the realm of etiquette, the sorceress is within her rights to be offended, but her threats to kill the child on her 16th birthday is a bit of an overreaction. Though Sleeping Beauty has a definitive DON’T game of cat and mouse between Maleficent, the evil sorceress, and Briar Rose/Princess Aurora, I recall with much more clarity and fondness, the female bonding of Briar Rose and her three fairy godmothers: Flora, Fauna, and Merryweather who risk wing and wand to keep Briar Rose safe from Maleficent, raising her as if she were their own. They raise her to be graceful, sweet, loving, and somebody ponied up for voice lessons! Now that is one DO I can do with! Another sorceress, this one under the sea, hell bent on destroying the life of a fair princess as a means of revenge on her parent is Ursula the sea witch of The Little Mermaid. Ursula has a long-standing feud with Ariel’s father, King Triton, but instead of fighting him directly, she gets to him and his trident of power through her tricking of Ariel into an impossible bargain. And where were Ariel’s trillion sisters when she was being sucked into the sea witch’s lair? They should have been confidants and protectors, keeping Ariel safe! Ursula hoodwinks Ariel out of her precious talent of singing, only to use Ariel’s voice for her own diabolical plan. This is a girl code DON’T on land and off. The worst part is that she convinces Ariel that she is trying to help her unite with her erstwhile paramour, Prince Eric, when really she just wants to use her as leverage in a power play with Triton. The whole, “keep your enemies closer,” may be A-ok in the world of warfare, but it has no place in the universal sisterhood. DON’T! As previously visited upon in a past post, y’all will remember Alice in Wonderland’s brief but brutal battle between Alice and The Queen of Hearts. Threats were screamed, insults hurled, enemies made. 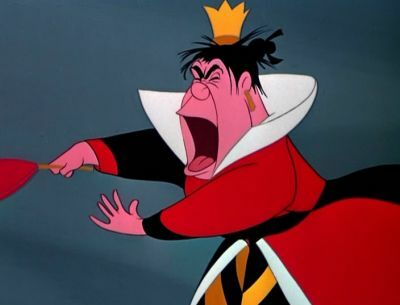 The Queen of Hearts is a bully with a kingdom at her disposal. Alice must escape narrowly from the seemingly hormonally charged Queen of Hearts. Talk about mood swings! One minute she and Alice are playing croquet, next thing you know the queen is threatening to have Alice beheaded! Here’s another DON’T perpetrated by Disney: painting women as moody, erratic, and unbalanced. I DON’T like women being represented by a monarch in the throes of her menzies. I want to wrap this post up with a DO and I find it in Disney’s Pocahontas. Pocahontas has a rather remarkable relationship with nature, painting with all the colors of the wind and whatnot. One of her many woodland friends is a spirit in a willow tree, very aptly named Grandmother Willow. 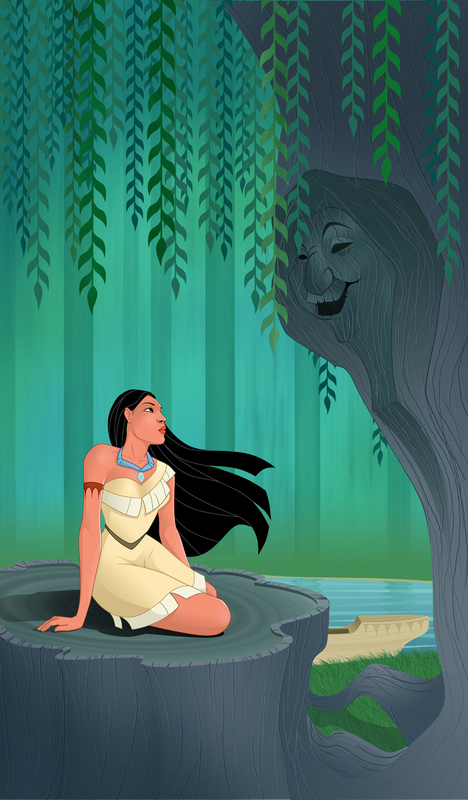 Pocahontas treats Grandmother Willow with the utmost respect. She comes to her for guidance and follows her advice, trusting in her wisdom. In turn, Grandmother Willow seeks only to protect and help Pocahontas. This combination of respect for one’s elders, appreciation of nature, and women appreciating each other’s worth is a complete DO! So caregivers male and female, one and all, let’s be sure to dispel certain stigmas associated with step-relatives, and encourage kiddos to be supportive of each other, reminding them that jealousy or self-doubt is no excuse for cruelty to others.